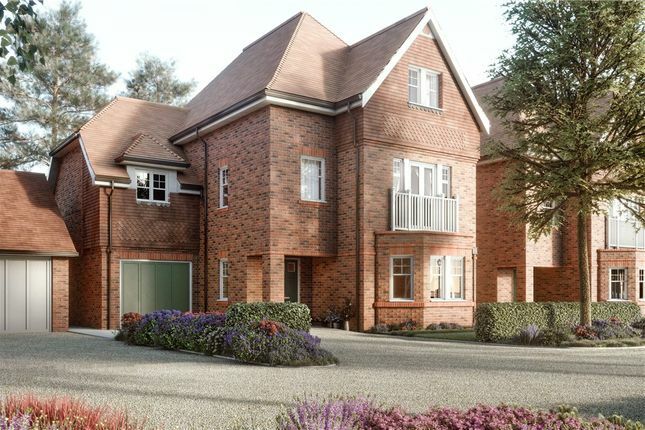 The Oak is the largest of the five bedroom houses in Lakeside boasting 2,579 sq. Ft. Over three floors. These beautifully designed, detached homes are situated overlooking the feature lake offering spectacular views from the living room and master bedroom. The open-plan kitchen, dining and family areas are perfect for entertaining and double doors open into a private garden. On this floor there is also a formal living room, utility room leading off the kitchen and WC. The private garage is located to the edge of the property and can be accessed from the front of the house, through the family area or through the garden. The first floor is home to a study and three of the five bedrooms, all of which are en suite. The master bedroom also offers an expansive separate dressing area. Continuing your journey onto the second floor takes you to the final two bedrooms. 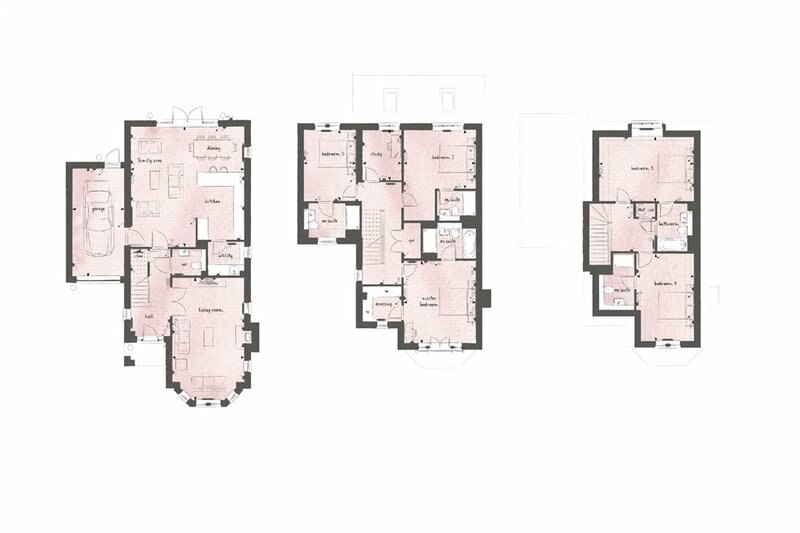 The fourth bedroom is en suite and there is an additional family bathroom available for the fifth bedroom. *Sat nav GU14 0LP. Please note that all images are Computer Generated Images and are indicative only. Spacious living room with feature bay window and fireplace surround with provision for flueless gas fire fittings. Open plan kitchen/dining/family area with french doors leading out to the private rear garden. Kitchens benefit from individually designed layouts with a choice of traditional or contemporary kitchen schemes subject to cut off dates. Integrated Bosch appliances to include a gas hob, re-circulating canopy extractor, stainless steel multi-function oven, stainless steel microwave oven, integrated fridge / freezer and integrated dishwasher. Utility with white high gloss cabinet doors with co-ordinating laminate work surfaces and upstands, stainless steel bowl sink to work surfaces and polished chrome mixer tap. Front aspect master bedroom with juliet balcony and dressing room. Luxury bathroom with Polished chrome wall mounted thermostatic bath / shower mixer / diverter with polished chrome showerhead, slide bar and glass shower screen over bath, Polished chrome finish ladder style thermostatically controlled heated towel radiator and bespoke mirrored cabinet with shelving, shaver socket and concealed lighting. Property descriptions and related information displayed on this page, with the exclusion of Running Costs data, are marketing materials provided by Romans - New Homes, and do not constitute property particulars. Please contact Romans - New Homes for full details and further information. The Running Costs data displayed on this page are provided by PrimeLocation to give an indication of potential running costs based on various data sources. PrimeLocation does not warrant or accept any responsibility for the accuracy or completeness of the property descriptions, related information or Running Costs data provided here.